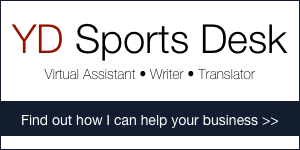 The sports industry is often one of the early adopters of the newest technological innovations. By quickly adopting technological developments, sports organisations hope to improve the on-field and off-field performance and to outperform competitors. There are countless examples of how technology is used to improve sports performances. For example football uses movement-tracking technology and tennis rackets have sensors embedded to analyse strokes. Besides improving on-field performances, technology can also improve the fan experience. The international sports industry uses the latest popular technology, such as virtual and augmented reality, to make that happen. Recently I interviewed a German innovation company that uses online communities to generate innovative solutions and ideas. Currently they are looking for ideas for the future fan experience in sports. As expected, it is technological novelties that can (or rather should) play an important role in improving this. The company is not alone in consulting sports fans to improve the fan experience. NBA-team the Golden State Warriors, located close to tech-hub Silicon Valley, asks fans to come up with ideas on how technology can improve the experience in their yet-to-built stadium. A smart move! Give fans a voice and have the willingness to listen. Technological innovations are great, but not just for the sake of implementing something new. Over the last decade major steps have been taken to make technology an important, often successful, part of the sports experience. Fans can use Wi-Fi in many stadiums and mobile applications and beacons make buying food, going to the restroom or parking much easier. However, technology also has the ability to undermine the fan experience. Do fans really experience the moment supreme, for example, when they are all holding a smartphone? It is therefore important to check whether new technological innovations really have an added value for sports fans. Virtual Reality (VR) is a technology the sports sector uses more and more. VR gives a computer-generated representation of a real environment that people can interact with by using gadgets. VR is used as a training tool to improve sports performances. There are golfers using VR to improve their swing. Football players could also use VR to practice penalty kicks in ‘sold-out’ stadiums. Besides pure sports specific applications, sports organisations also use VR to improve the fan experience. This year the NBA offers a game per week in virtual reality, for example. The fans at home now have a new way to experience basketball games. An experience that comes much closer to the stadium experience. Sports organisations are also using VR in-stadium to improve the fan experience. The Golden State Warriors has, together with technology innovation partner Accenture, recently given stadium visitors a VR viewer to watch a specially developed VR movie. To get the complete article, please allow cookies by clicking Accept on the banner. Moreover, VR has practical applications for the fan experience. Fans can for example preview different seats with VR before buying a ticket. This gives fans an idea what they will be able to see during games and whether a courtside or upper level seat is the right choice. Augmented reality (AR) – a technology that can augment the environment or add images or sounds – is, just like VR, gaining popularity in the sports industry. American Football team the Denver Broncos uses AR for a fun fan experience and to activate sponsorships. The “make your cup come alive”-promotion gives fans a unique experience by making drinking cups come alive with the AR feature in the mobile application. Fans are persuaded to buy something to drink (value to sponsors and income) and to download the mobile application (value to the club) in order to experience the AR-promotion. Sports can often be an early adopter of technological innovations, because a lot of sports organisations have partnerships with technology companies. Together they can quickly and smartly implement technology to the advantage of fans. Like in the example of the Golden State Warriors and Accenture. The sports industry can just as well activate deals with other partners by using technological innovations. You only have to look at how the Denver Broncos uses AR to create value for the club, partners and fans. Another example comes from the Spanish football league that has established a partnership with Intel. During El Classico between Barcelona and Real Madrid earlier this month, Intel’s 360-degree replay-technology gave fans a view of key moments from all angles. There are technological innovations that quickly disappear after introduction. Google Glass is an example of that. Different sports organisations and athletes used the gadget, but it has not yet found a permanent place in the sports industry. This makes it even more interesting to see what Spectacles – smart glasses that can make 10 second Snaps (clips) for on the popular social media channel Snapchat – will do. Spectacles are not specifically introduced in sports, but made limitedly available through pop-up vending machines. Nevertheless, some American sports organisations have gotten hold of the glasses. Premier League club Manchester City has also already been able to use Spectacles – due to their partnership with New York City Football Club. There will be future technological innovations that will drastically change the way we experience sports, while other innovations, like Google Glass, will be fun for as long as they last. The sports industry seems to be the ideal sector for introducing new technology, because sports organisations have in general a lot of touch-points with fans and have access to enormous fan bases of which a portion will always be interested. It will be interesting to see how technology such as VR, AR and Spectacles will change the fan experience in 2017 and the following years. Is the market for sports TV rights about to crash?